Literacy for Children in an Information Age 2 Edition Developed to meet the changing needs of K-12 instructors in today's information-driven society, LITERACY FOR CHILDREN IN AN INFORMATION AGE, 2ND EDITION, identifies the "new literacies" and provides practical tips for integrating technology in literacy instruction. The text emphasizes a balanced approach to reading education that incorporates both the whole language and skills-based/phonics approaches. It also features in-depth information on tailoring reading programs to meet the needs of a multicultural student body. Hundreds of examples of classroom practice include chapter-opening vignettes, student work samples, and examples of instructional strategies for various grade levels. 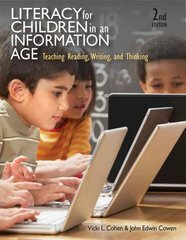 To address the fact that nearly every state includes technology-related competencies in its standards at nearly every grade level, this modern and relevant literacy methods text also includes examples of best practices, software packages, and websites.